Copyright Ritsumeikan University All Rights Reserved. Ritsumeikan University in Kyoto, Japan, announced on December 5, 2013, the development of a wake-up circuit that utilizes LED generated electricity and requires virtually zero standby power; the circuit starts only when in use. The research has been led by Professor Takakuni Douseki of College of Science and Engineering in the University. The terminal of an existing battery-powered wireless device needs a signal detecting sensor that requires a relatively large amount of energy when in standby mode. To avoid wasting energy, it is necessary to switch off such devices when they are not in use. 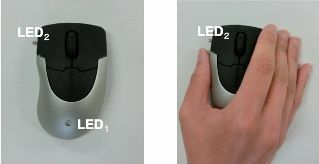 Through this study, the group has created a wireless mouse and a remote-control toy car without external on/off switches that reduce the required energy for standby power to virtually zero by modifying the circuit. For example, when the mouse is in use for three hours a day using this circuit, standby power is reduced to virtually zero, and this allows the power to last twice as long as in traditional products. The University expects this technology to be utilized in home devices that use wireless sensors, such as televisions, air conditioners and video game consoles.